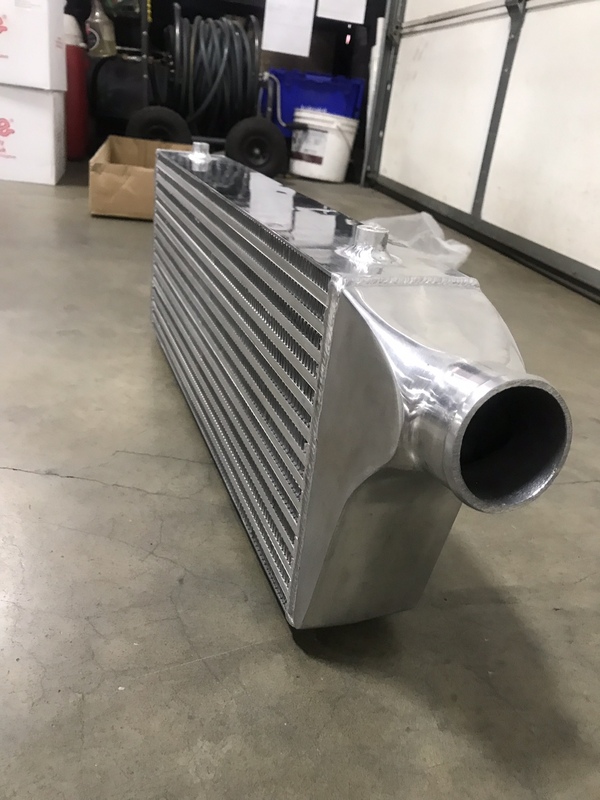 Update, apparently it’s impossible to get a new mod intercooler from anyone within a reasonable time or the time that was quoted. So I’m having my race shop build one. May turn out to be better this way anyway. If anybody knows of a supplier of a mod intercooler please let me know. 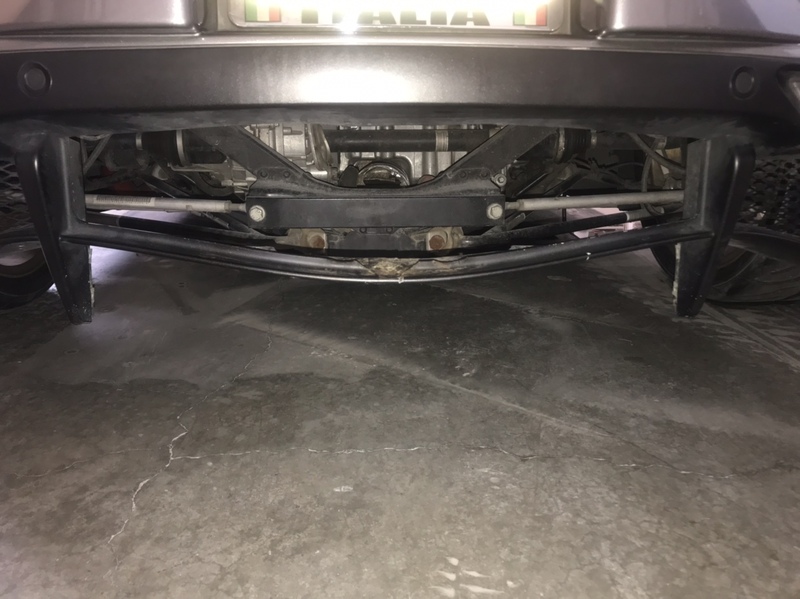 Is there nothing off the shelf that will fit, from some other car (OEM or mod)? Or is the pressure too much of a concern? The stock one looks really plugged up. I now think that is why I had a turbocharger under boost problem most all of last year. 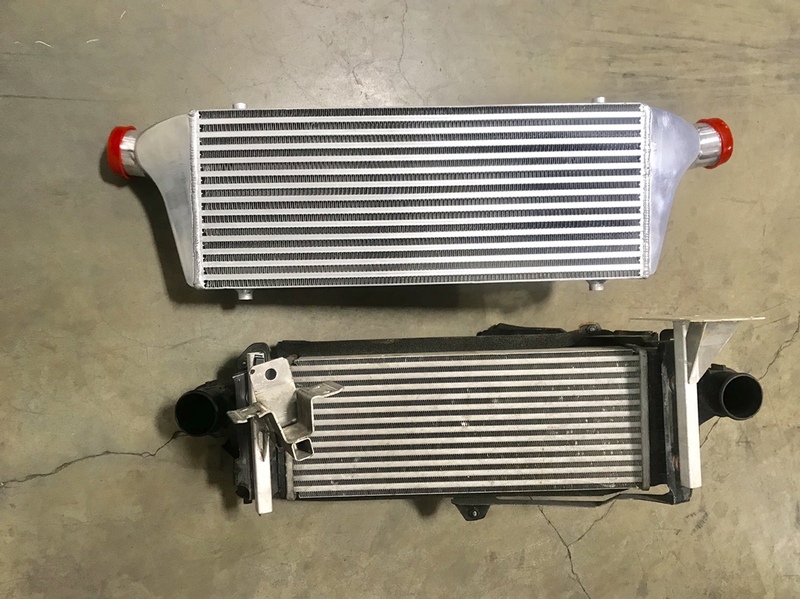 I don’t have a spare OEM intercooler and also I really want to get the extra breathing, cooling and other benefits of a larger intercooler. Especially with the increased boost and power I will be getting. We are looking for some off-the-shelf ones that might be the right size with some small mods. But the worst case scenario is we just build one. It’s just frustrating as this is twice I’ve waited for promised intercoolers that never showed up. I know it’s not the fault of the people who promised to get it to me on time as they were depending on others who let them down. But I’m tired of being let down. Hmm why does that sound familiar? 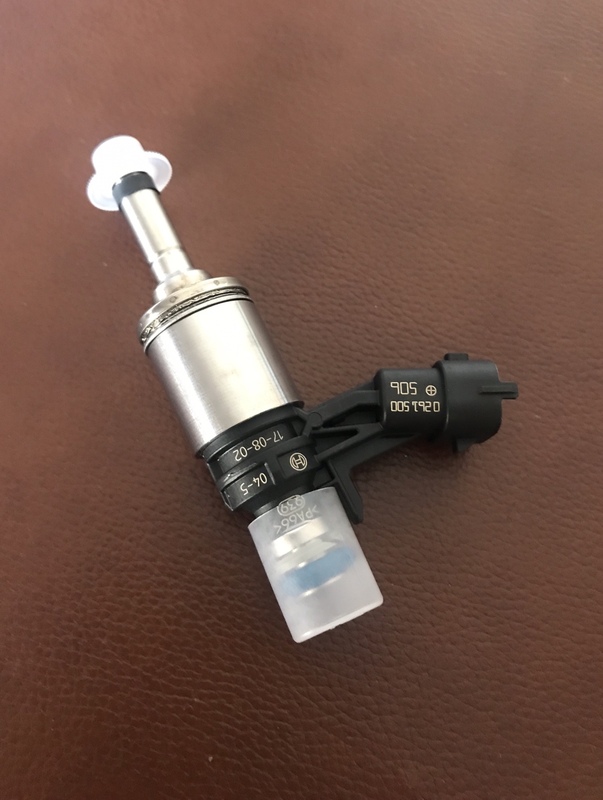 It’s almost tracking season now and I’m not going to pin my hopes on a manufacturer making one in a reasonable about a time when I can just have my local race shop build something that could be better and for the same price or less. And we here we have some even better ideas like using solid metal pipe instead of hoses so you have less turbo lag because of the time it takes for pressurization of the soft hoses. With our design there would just be very small especially strong short hoses at the connections. Also today we have a new mod. I’m going to build custom upper control arms that will eliminate the upper ball joint and give me all kinds of easy adjustment without even using any shims. Lots of negative camber without having my car having to be so low to the ground. lkone, Alfanut and 4C-ophe like this. @Call me Al - I agree that some of the custom A-arm modifications that have been executed lately are the way to go. Far easier adjustability, and will prevent tub slapping of the arm at high camber rates (at least in the front). Great job, keep us posted! I’ve got a whole lot of mods being done this Spring. Some of them are pretty exciting even groundbreaking. 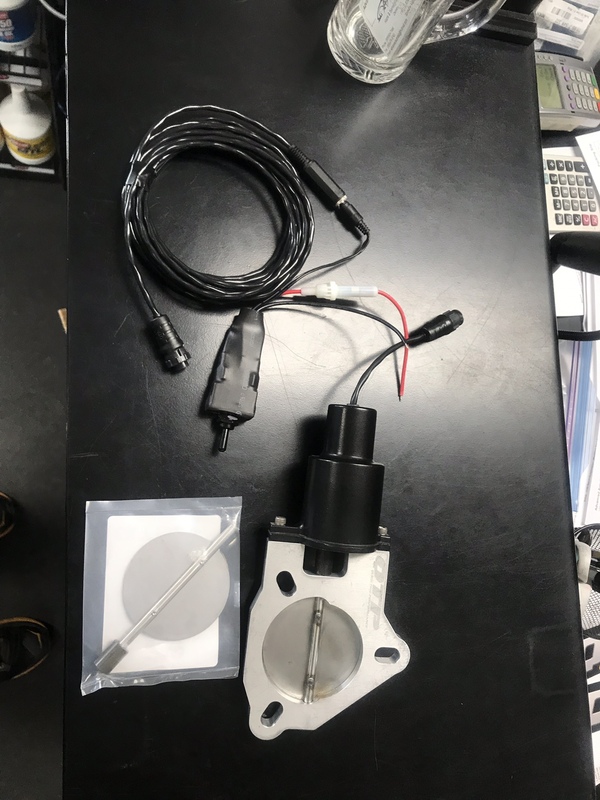 Parts are showing up and being installed so I thought I’d start a post on it. Custom tune ECU increasing turbo pressure for my custom engine mods. Change turbo oil inlet piping. Change banjo bolt turbo micro filter. Install metal turbo to intercooler pipe. Build and install mod larger stronger intercooler with pressure rating up to 40psi. Install mod larger fuel injectors. Make custom cold air intake and air filter system. New custom electric valved exhaust all 3 inch piping, catless with two volume (DB) positions: extremely LOUD (105+ dB) and quiet (90dB) with 2 mufflers. 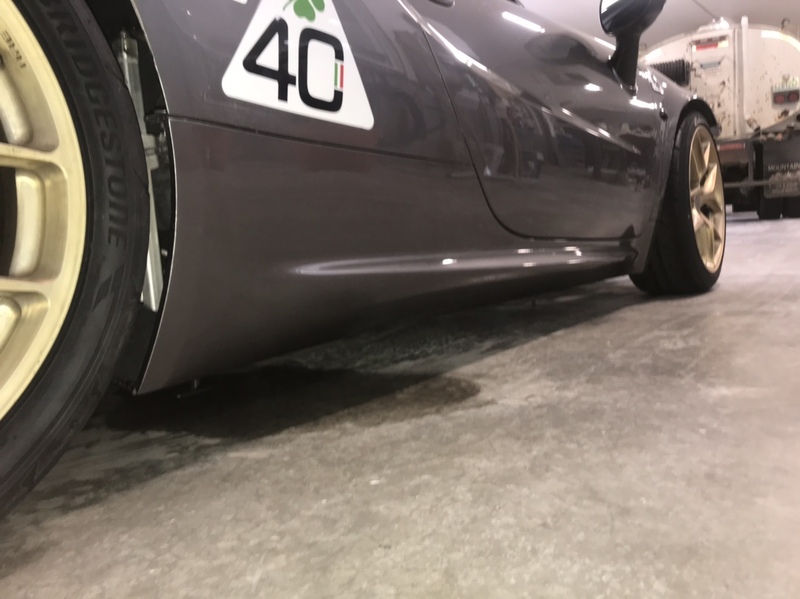 Large tri-piped trapezoid and trapezium shaped tips that will fill out the entire area between the two vertical bars on the rear diffuser. Install gearbox cooler in the intercooler area. Raise car so it is 1 inch higher off ground than it is now. Custom front control arms with a heim joint and easily adjustable camber no shims required. Full suspension alignment and camber check to be -3.5 camber or more. Switch out front worn out Girodisc brake rotors to new Girodisc rotors. Rebuild rear brake calipers install new PFC 13 brake pads. Make the hood quick remove. 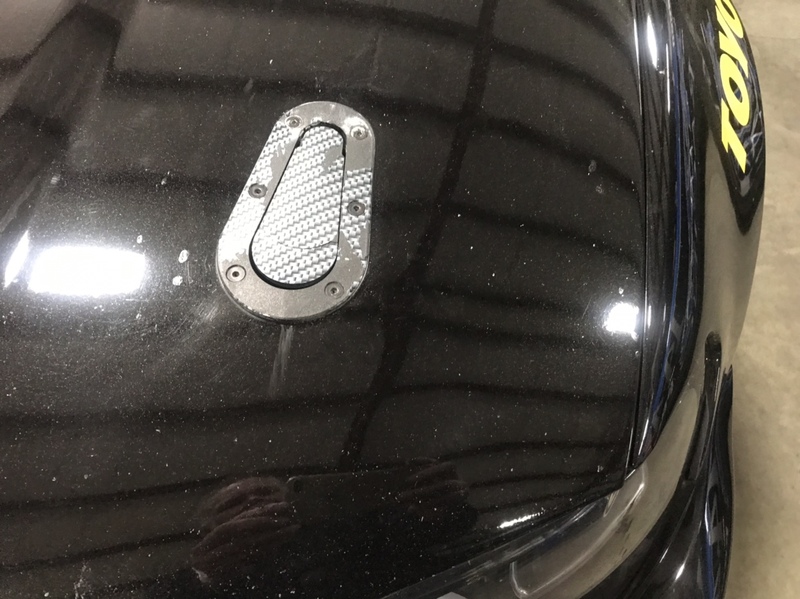 Make new metal fender liners of aluminum and plastic sound deadened. 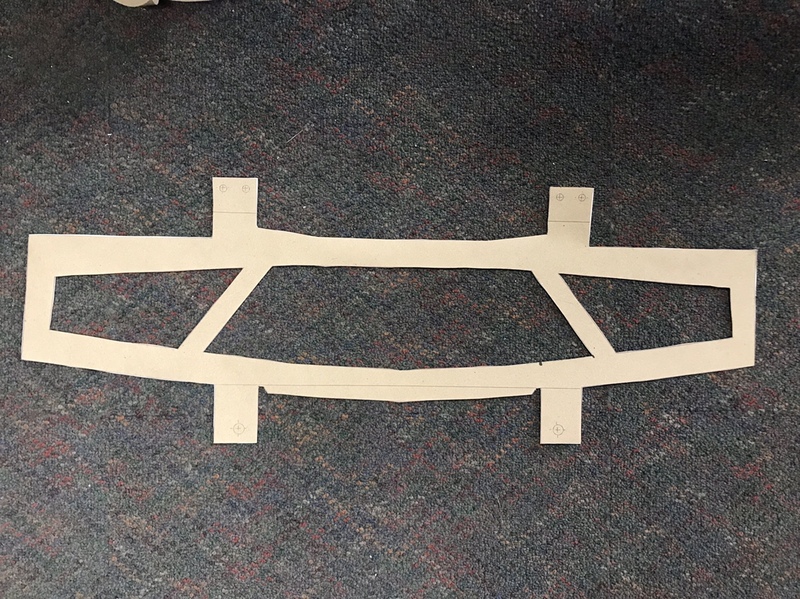 Make abs plastic skid plates underneath lower rocker panels to support worn body panels and protect for scraping on curbs on racetrack. 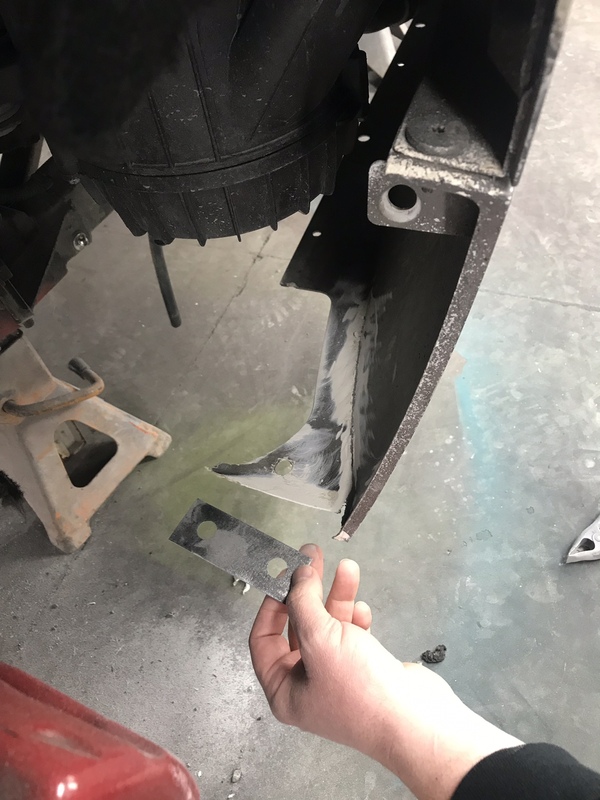 Repair and paint lower rocker panels. Protective film the front bumper, hood and side rocker panels. Mod intercooler still needs modification to one tank end. Much larger and stronger than stock one. Modified turbo, improved impeller, stronger bearings, lightened and balanced. 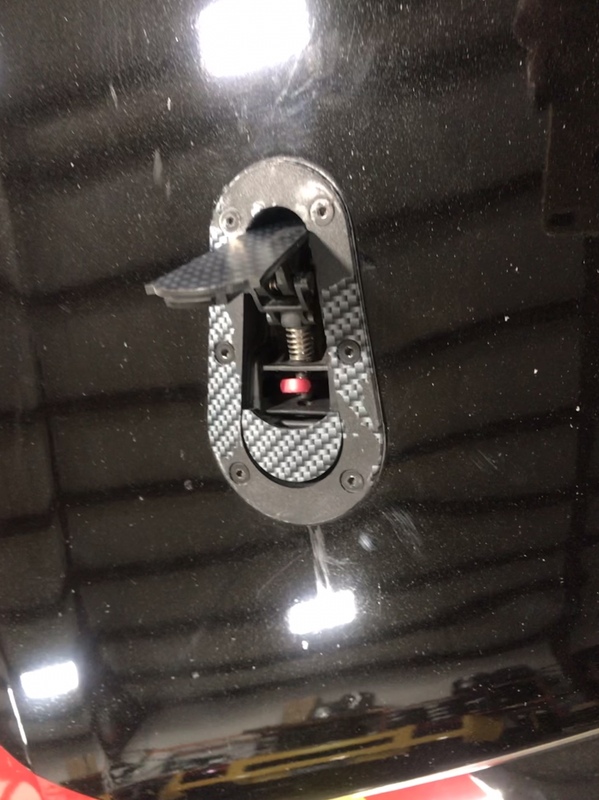 The type of quick hood release latch I am going to use. Rocker panels all repaired, painted and ready for protection film. marcpal, 4Canada, lkone and 7 others like this. Last edited by Call me Al; 03-28-2019 at 04:29 PM. Super impressive. I didn't even know you could do so much to a 4C. Threads merged at OP request. Looks great. Can’t wait to see it out on track again! The stock one looks really plugged up. 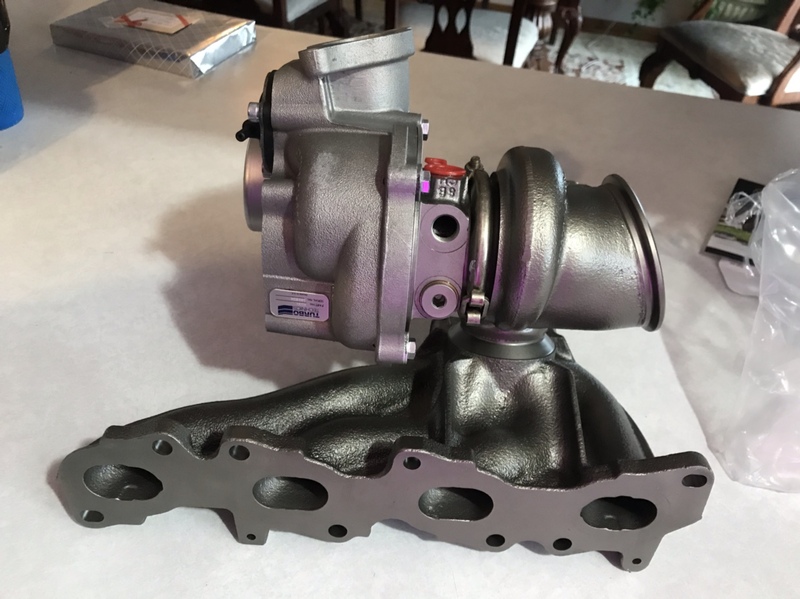 I now think that is why I had a turbocharger under boost problem most all of last year.